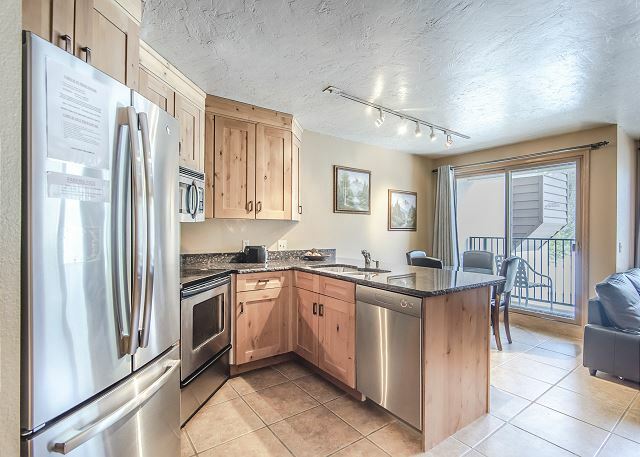 Beautifully updated 1 bedroom condo, located just steps away from the lift. 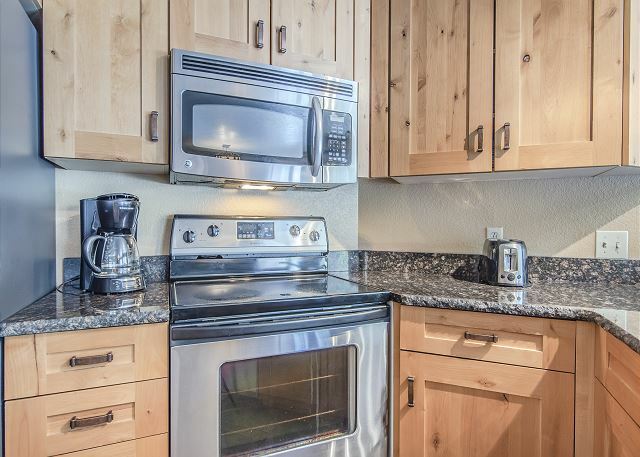 This light adorned unit features granite counters, stainless steel appliances, nicely updated baths, and a flat screen TV. You can comfortably sleep up to 6 people with the new king sized bed , murphy queen bed, and the new sofa sleeper in living room. 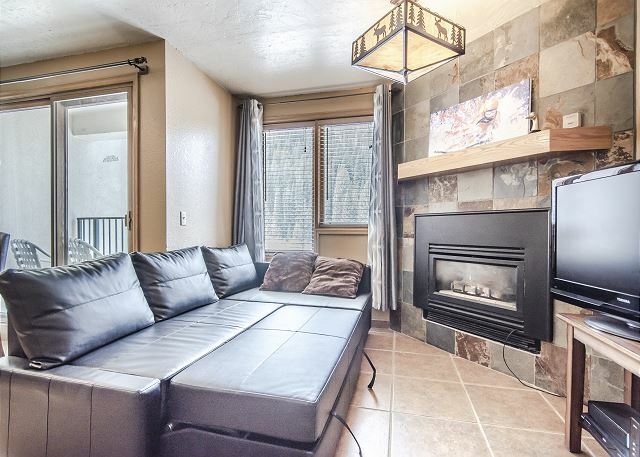 Relax in front of the large fireplace after a day in the mountains. 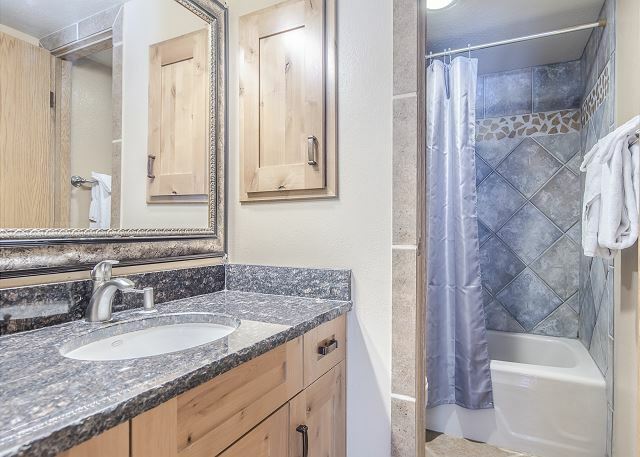 Everyone will enjoy the nicely appointed bathrooms featuring granite counters and updated tile baths. 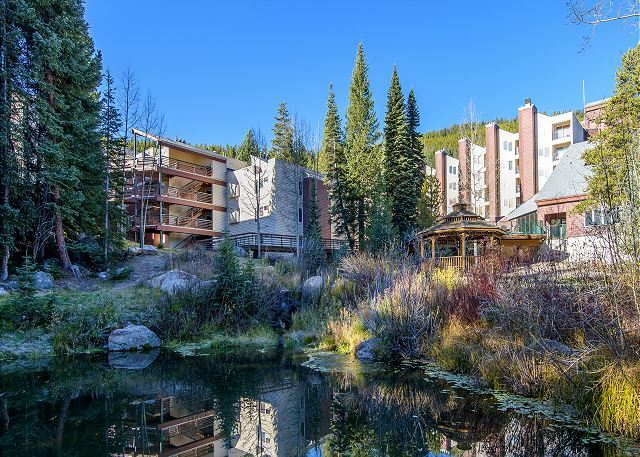 The Iron Horse Resort is a full service Ski Resort that features everything you need to make your stay wonderful and relaxing without leaving the premises. 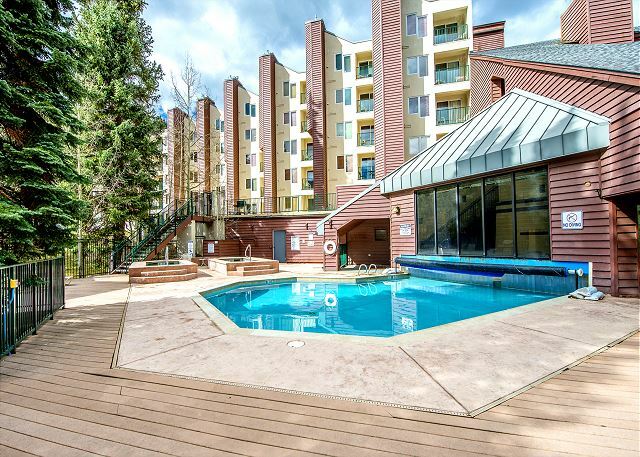 Make sure you bring your swimsuits as this complex offers a year around indoor/outdoor heated pool and 2 large outdoor hot tubs, in addition to a fitness room with steam rooms and showers. For added convenience a full service ski shop is located on the property. At this shop you can rent all of your ski and board equipment, buy ski clothing or get a full tune. Washers and Dryers are available on the second floor of the D building. 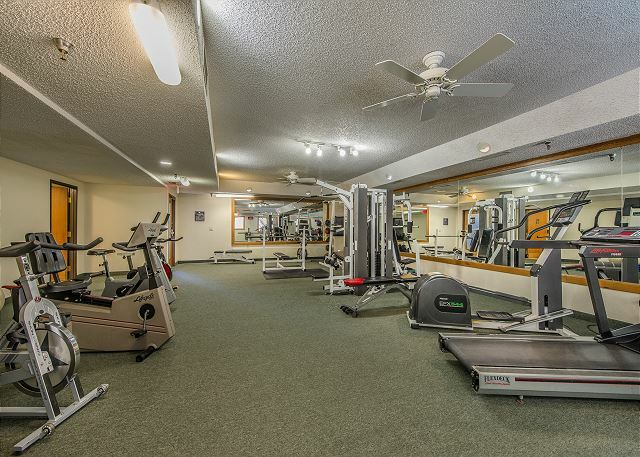 For a relaxing, easy, and enjoyable vacation, come stay with us. 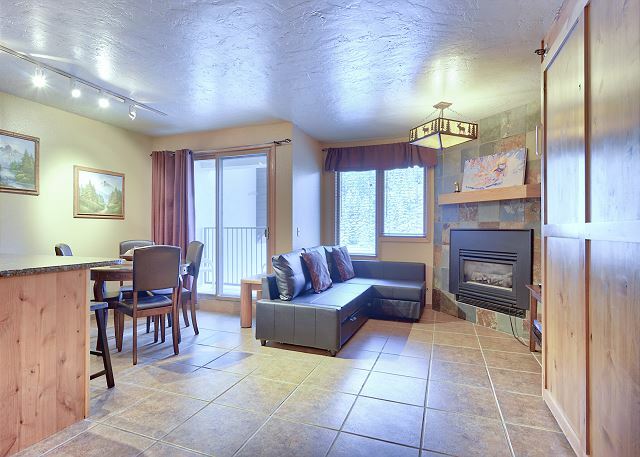 If you have friends or family going you, we also have studio condos and 2 bedroom condo in same building. Thanks for taking your time to write about your stay. Happy to hear that you were happy with the condo and that it worked out well for your family. We had a good experience in general. The shower drain was broken but the staff addressed once notified. Having a parking garage was very nice. Location was excellent as Iron Horse is first stop on green line busing from Winter Park ski resort. Everything was great. I had to modify the original reservation--no hassle. Easy to contact the management with questions. Thanks for staying with us and for taking your time to write about your experience. Happy to read that you found everything great and that we were able to meet your expectations on a customer service level. 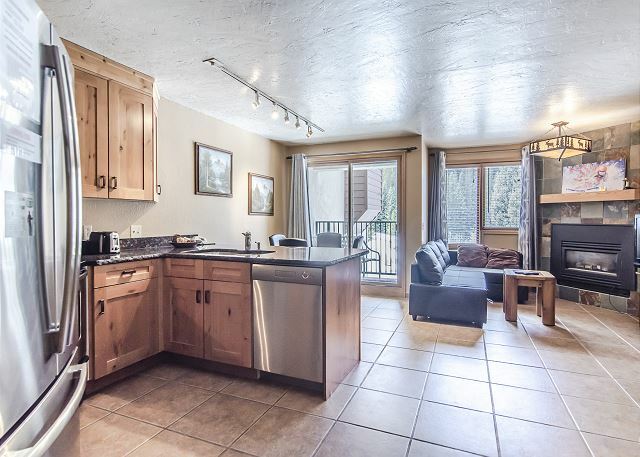 The condo was very nice, had everything you could want for your family ski weekend. The only suggestion would be that they need pool towels. The property was ideal for my family, we were disappointed however with the pool, it really isn’t a pool and should not be listed as such. It also was a little cold in the bedroom; we figure out why the next morning. The right bedroom window would not close all the way. So it made the room a little chilly. Other then that we liked it. The place was clean and charming we would stay there again, hopefully with the window fixed and new dining room chairs. Thanks for taking your time to write about your stay. I am not sure what you mean by "it really isn't a pool"? There are 2 hot tubs and a heated pool. Part of the pool inside (smaller portion) and the other part outside. Pool is heated all year round (around 88 degrees) I will make sure that we get a look at the right bedroom window. It for sure should close all the way, so let me get a maintenance guy up there immediately to get it fixed. We were in town for a gymnastics competition at the rec center. This location was a short walk to the ski village. Plenty of room for our family of 4. Thank you Laurie for choosing Winter Park Management. We hope your daughter competed well and your family had a great time and made some great memories. We would love to have you all back again. Keep us in mind for any future adventures...or the next gymnastics competition. Take care. Family of 4 (2 adults 2 Kids) stayed in this property. Plenty of space for all of us. Kids enjoyed the swimming pool and the game room. The hot tubs were being worked on while we were there so that was a bummer. 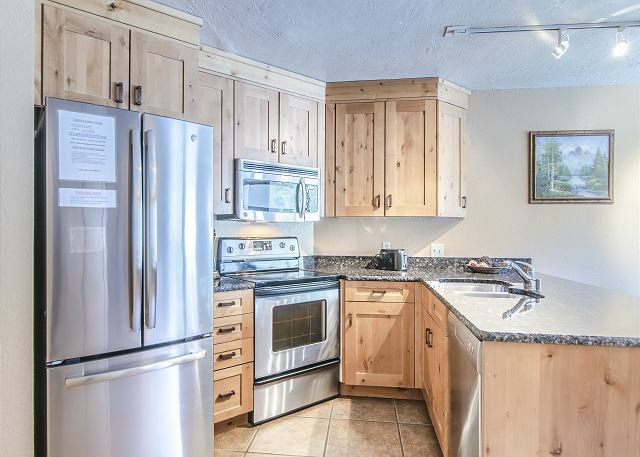 The unit and the property were very nice. We also used the lobby area for large group dinners and there was plenty of space to accommodate our large group. Thank you Keri for choosing Winter Park Management for your stay in the mountains. Sounds as if you and your family were very active and enjoyed your time. We apologize for the hot tub issue as that was out of our control. We are so pleased that your overall experience was pleasant and you made some great memories for your family. Please come back again soon and stay with us. We would love to have you back! Take care. Nice property. Great location. Ski-in & ski-out; ski rental shop on property; ski locker right by the slopes were all so convenient. Property management was very responsive to one small issue that we had. Beds were comfortable. Only constructive feed back: Spend a couple of hundred dollars on a new toilet! Weakest flush ever. I would definitely stay at this condo again. Thank you for your feedback! We appreciate when our guests take the time to give us their comments. We are so pleased that you enjoyed your stay with us. We will pass along the information about the toilet to the owners. Please come back and stay with us again. We would love to have you back! We stayed at Iron Horse during our spring break to ski and enjoy the snow. 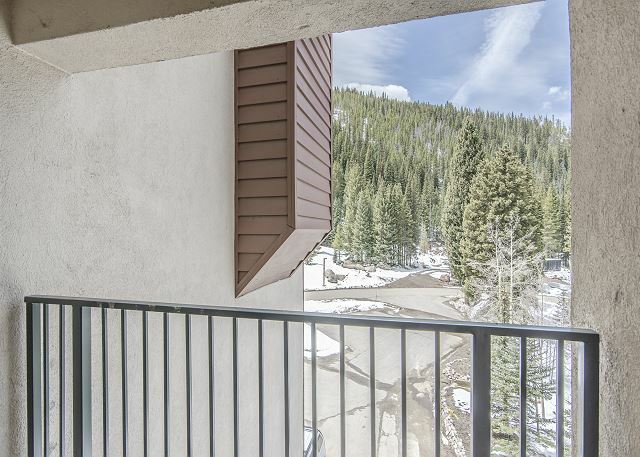 Very Comfortable room and convenient to the slopes and Winter Park. We loved the Ski In Ski Out aspect! Lockers on 5th floor to store equipment. The beds were comfortable, great kitchen. Has all necessary utensils for cooking. Overall would stay again! Wonderful. We are so pleased that you enjoyed your stay. Glad you enjoyed the convenience of the ski in / ski out. We are glad you will be back again to stay with us. Looking forward to it. The place fit four adults snugly. Murphy bed was surprisingly comfortable. 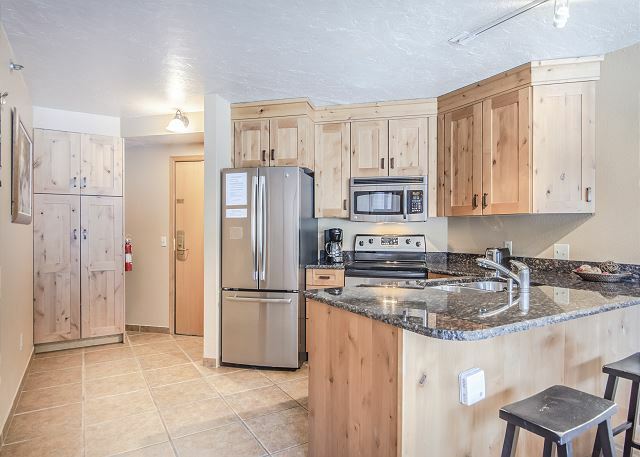 It is a ski in/ski out condo with a couple large storage rooms inside the building 50 feet away from the ski run which takes you down to the main ski lodge. The cafe in the building was a nice surprise. Hours were limited, but it worked out. Also, there isn't much in easy walking distance to the condo and the town bus system is workable but not that reliable. The codes required to get anywhere in the building were an annoyance for everyone, but this is a minor point. The toilet leaked, but the leak was fixed right away. It never flushed well and that should be fixed. All in all, nice place, nice management, great location. Thank you Marc for your feedback. We are looking into the issues that you have presented to us in this unit. We are glad you enjoyed your stay and we welcome you to come back and stay with us again soon. Thank you Joe for your feedback. We appreciate that you are a repeat customer at Iron Horse and we welcome you back again many times over. Looking forward to your next return. Thanks Joe! 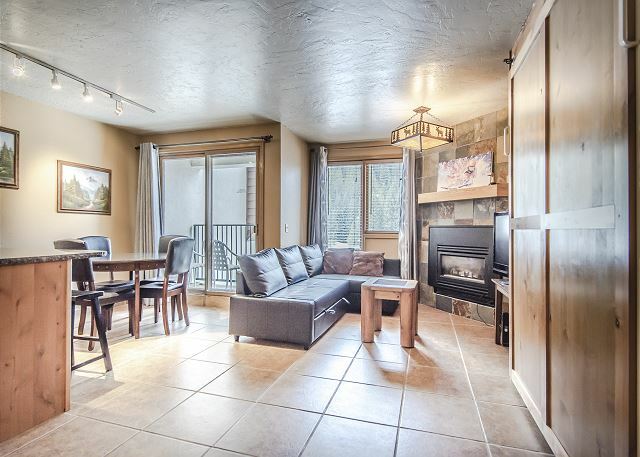 Nice condo in great ski location! The condo is updated and clean, perfect size for our family of 3. We loved the short walk to the slopes for skiing and having the cafe downstairs for dinner. 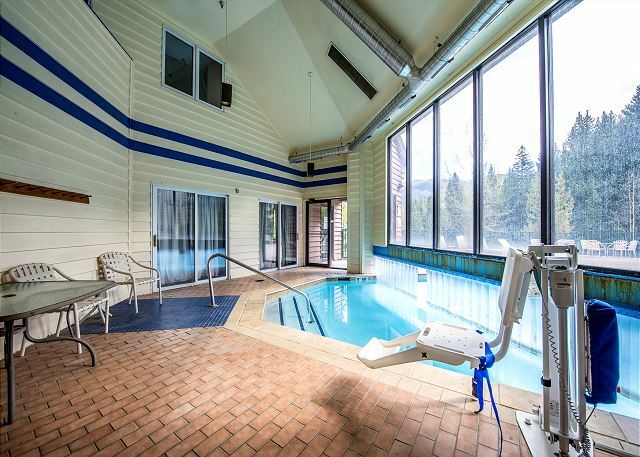 The pool & hot tub + game room are great amenities - everyone thought so, very busy. The cafe staff was very friendly, as was the front desk staff. WP Management was very attentive when we had questions. If we had an onsite issue, not sure how quickly we'd get help, however. The front desk staff is limited in what they can do for condo visitors. Thank you for your comments. We appreciate feedback. We are glad you enjoyed your visit with short walks and cafe downstairs. We have onsite management team ready for your service 24/7. If you would have had an onsite issue, we could easily help you the minute you called one of our managers. In each of the property units there is a laminated list of all phone numbers to contact in case you need assistance. We are glad you did not need to use our onsite management team but for the future visits please keep this in mind. Our goal is your complete satisfaction. Thanks again. Take care. a guest from Otsego, MN does not recommend this vacation rental. The stay was as published. It was very clean and relaxing. The views were disappointing, as you are very much tucked into the trees. I was expecting to have a mountain view, but there was no such thing. However, they never said there would be. The resort was very nice, but it is about a 5 minute drive from the town itself. We came during the summer, so it would be better to be s little closer to town. 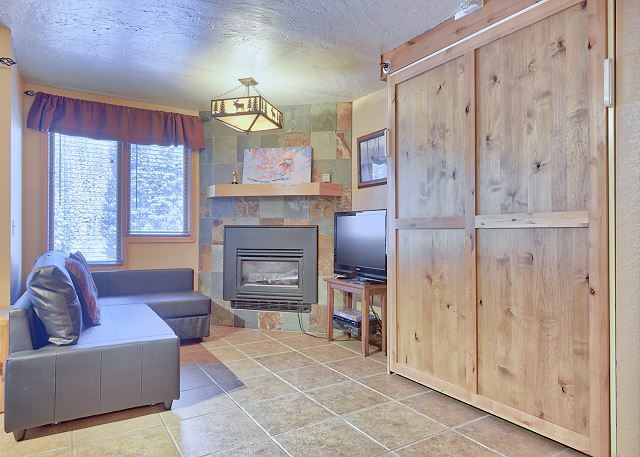 For winter, the location would be great as you are walking distance from the slopes. Overall, it was good. 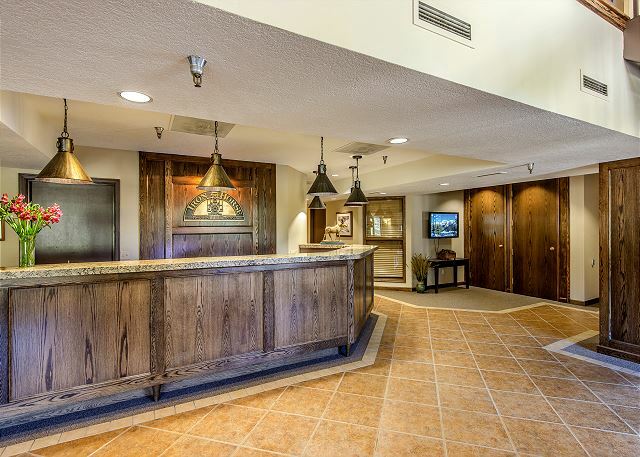 Thanks for taking time to write about your stay. 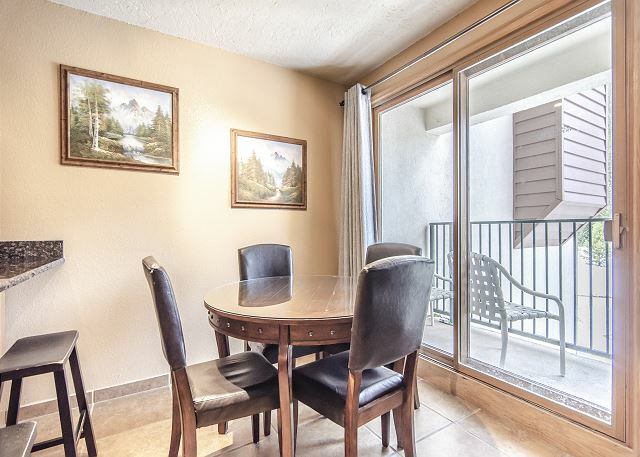 I am sorry that you were disappointed with the views of the condo and the location that you picked. BUT I do hope that you still had a good time visiting Winter Park. Had a wonderful time in Winter Park and really enjoyed the accommodations. Happy to hear you had a wonderful time in Winter Park! My two adult sons and I stayed here for 6 nights in July. The room was great and suited our needs. We thought the location was great for hiking and traveling the area. It was clean and very well furnished. The only negative we had was the Sleeper sofa is wore out and the springs rest on the metal cross bars making it very uncomfortable. The resort itself is great. 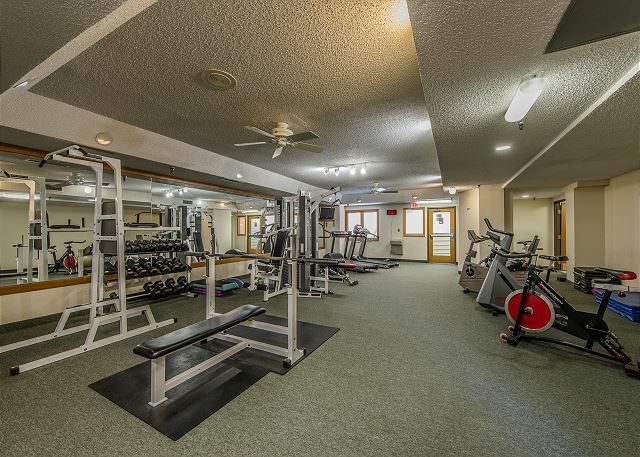 Wonderful amenities. 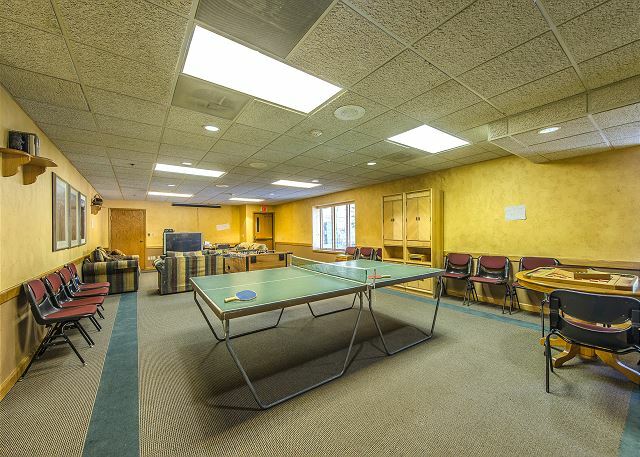 Game room with Foosball, ping pong table and air hockey table. Garage parking, which whether visiting in the winter snow or summer rain is great. The grounds are gorgeous. Ponds, green forested paths, the beautiful river running through the property. The 2 hot tubs, pool that goes from indoors to out, sauna in the locker room, and great showers in the locker room were fantastic. 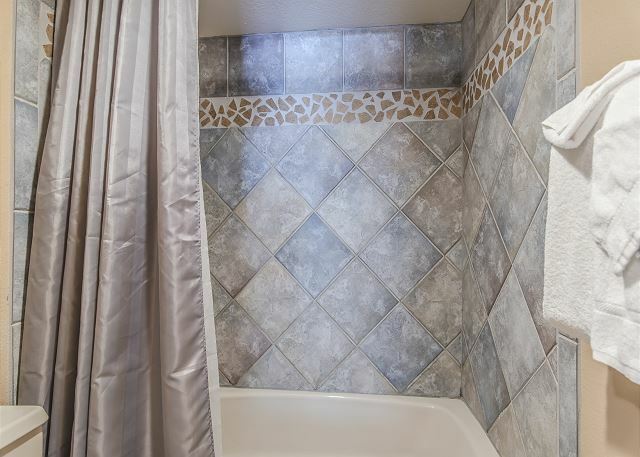 The condo is pretty, with an updated kitchen, and beautiful tile work in the bathroom. There is a nice table for eating or sitting at. Small balcony, that doesn't have the greatest view, but it's nice to be able to step out and watch the rain/snow/breeze in the trees. The bed is INCREDIBLY soft, which I love, so it was great for me, but not everyone would love that. TV had some movie channels so it was nice to sit and watch a movie in the evening. 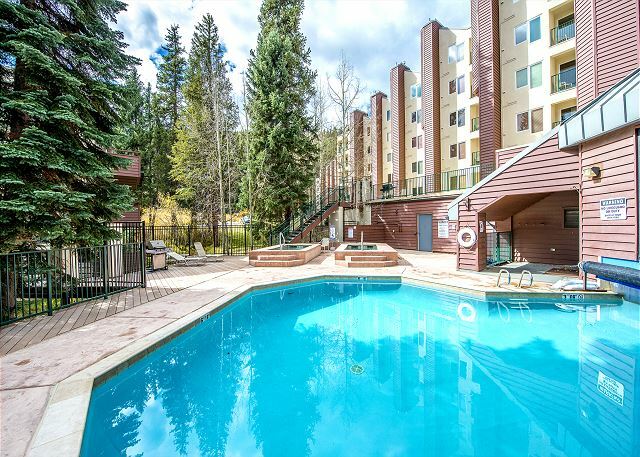 The resort is located within walking distance from Winter Park Resort, which is wonderful winter or summer. There aren't many, but there are a few. The furniture (leather chair and sofa) are in desperate need of replacement. The leather itself is cracked, peeling and not very attractive. The sofa clunked and felt like it wasnt going to make it if we actually sat on it (we avoided it as much as possible). The bathtub area is incredibly dark and the drain was slow to drain. And, I know this is absolutely no fault of the condo, but, there were other guests smoking marijuana INCESSANTLY on their balcony so we couldn't have our balcony door open, which made it hot in the room. Perhaps more fans (there was 1 table fan in the bedroom) would be great for some air movement. Lastly, check out is INCREDIBLY too early (10am), ESPECIALLY considering you have to strip the linens yourself, take out all the trash and do the dishes. 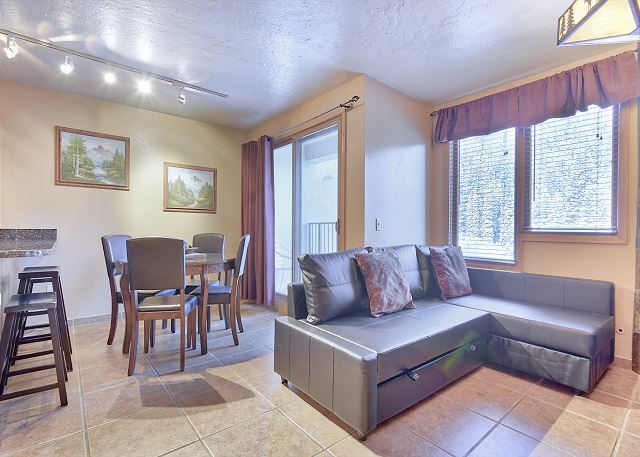 All in all, a good stay, a well appointed condo, just needs a little more love given to it (and later checkout) to make it a top notch rental. Pamela T from Castle Pines, CO does not recommend this vacation rental. 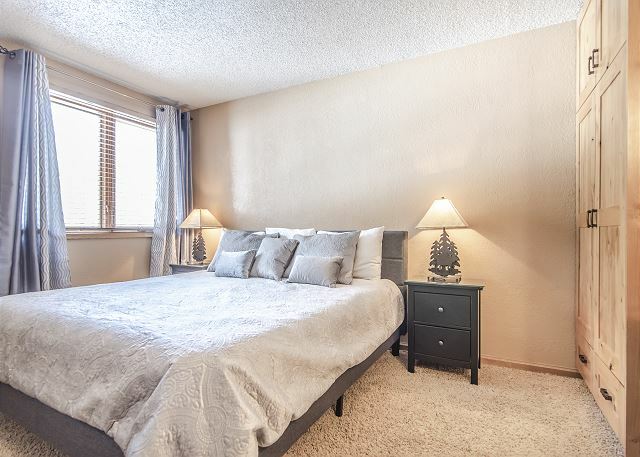 This condo is in a great location but the condo is very dark and queen bed in bedroom is uncomfortable. We are sorry to hear your stay was less than ideal. We will look in to getting a new bed in this unit. Fairly clean unit. Nice location to ski in and out from. More than adequate size for our family of four. 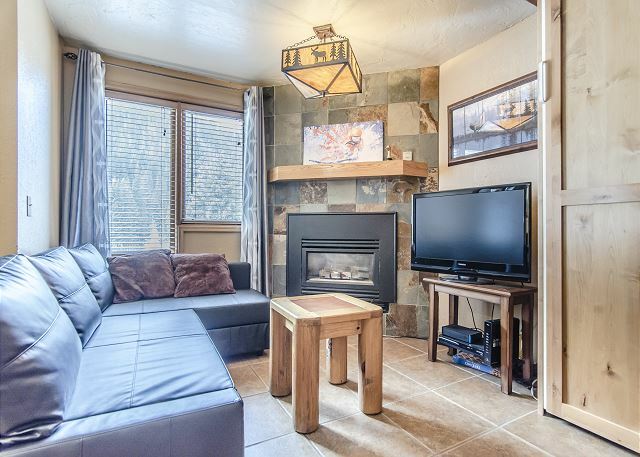 very clean, superb staff, great location, great place to get away for the weekend. everyone was very friendly and made a lot of friends in the resort alone. 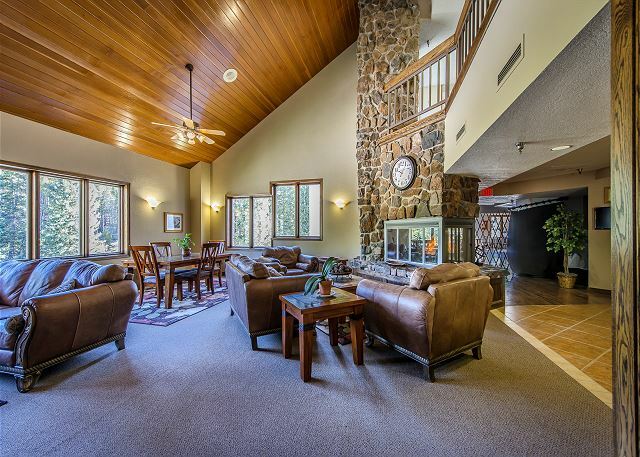 they have an amazing game room and pool and hottub. GREAT stay!!!!!!!!! So great that you met a lot of people in the resort. We have a very nice interesting group dynamic here, which many people enjoy. I'm glad everything was accommodated and worked out well. Thank you for the wonderful review and to see you in the near future with us! We enjoyed our stay. It was very clean and warm. The leather chair and couch were great. The location was also terrific. There are 3 things we would recommend fixing: 1. The freezer did not freeze, it only cooled. Our ice cream did not survive! 2. The humidier did not appear to be in good condition. 3. The toaster smoked and smelled horrible. Thank you for your review! So happy to hear you enjoyed your stay. The refrigerator/freezer has been replaced, and we will get a new humidifier and toaster over there today! Next time you stay with us just give us a call and we will take care of that right away while you are still here. Hope to see you in Winter Park again soon! Overall Facilities great, pleasant experience. Room could use some maintenance(Wrench used for shower handle, missing window screens). Would stay here again if we knew is was being up kept better. Thanks for taking your time to write about your stay. A new handle was ordered - but manuf keep telling us that it is on back order. We are aware of this issue and doing everything in our power to get it fixed!! Overall good. Wish it had A/C and the fixtures in the bathroom need to be repaired properly (not with a wrench to turn the shower off and on). Thanks for taking your time to write about your stay. Unfortunately there is not much we can do about the A/C. No property in Winter Park has A/C, but have placed an order for a new faucet and it will be replaced as soon as possible!! We were missing automatic dishwasher detergent and there was no iron. Other than that the unit was very comfortable and cozy. They also had window screens which kept the unit very Colorado cool and bug free at night. We'd stay again. Had a great time with the kids. We had 3 people, which was about perfect for the rental. It would've been cramped if the pull out sofa was used too, but for 3 or 4 it was great. 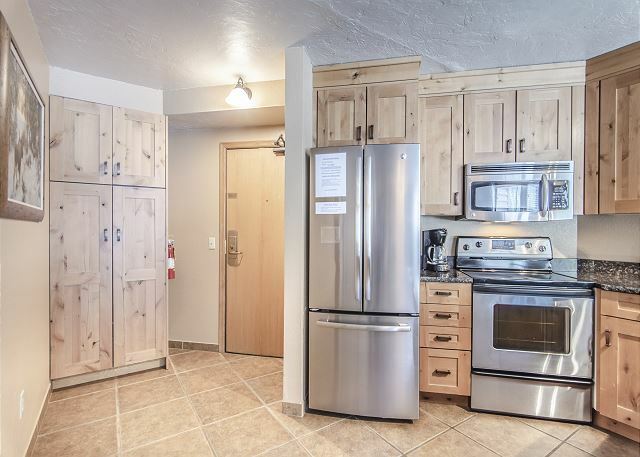 Really nice amenities, appliances and finishes. Hot tub/heated pool is great. Locker rooms and workout room looked nice as well (we didn't have time to use them). Only 1 stoplight down from the ski village, so pretty good location. Only trouble was with the garage, sounds like this is the same as with the other renters. The problem is with the garage, not the codes. We got in and out of the doors with no problem, just couldn't get the garage to work half of the time. Overall, we very much enjoyed our stay at Iron Horse, and will try to stay there in the future. The location for ski in/out was great. We had to walk from one building to the other for the ski access, but that was easy even in ski boots with the 5th floor bridge and being able to keep our skis right by the exit. The condo itself was very nice, had everything we needed. The kitchen was well equipped for cooking big meals. We're a family of 5, so a little cramped on space but no worse than a hotel room. The bathtub faucet wasn't working properly; the faucet just kept turning 360 degrees. We figured out where the hot/cold spots were and where to put it so the water would turn off, but it should be repaired. The pool was closed for maintenance and one of the hot tubs wasn't heating, so that was a bit of a disappointment. We had dinner in the lobby restaurant - no crowds, very good food but very pricey. Be aware: our minivan with a topper was too tall for the garage so we had to park in the surface lot (it's free, so no issues). 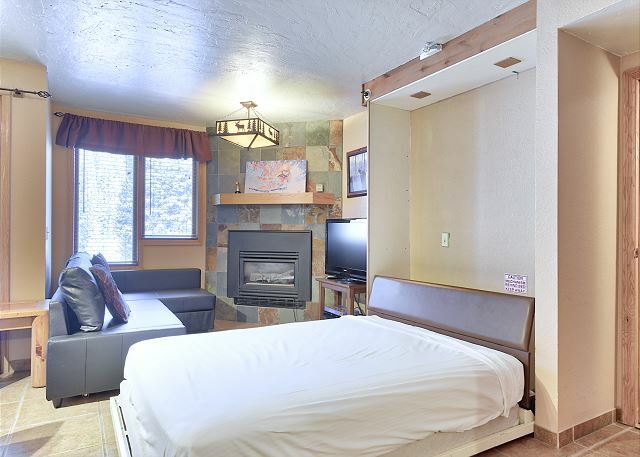 Thanks for sharing / giving feedback on your recent stay at this 1 bedroom @ Iron Horse. I am terrible sorry that the pool was closed and 1 of the hot tubs weren't heating well. I will share your email with both the HOA (regarding the pool / hot tub) and the owner of La Collina (restaurant). Once season slows down a little, we will be able to replace the faucet. HOA will need to shut down water in entire C bldg while we get plumber out to replace the faucet, and they don't want us to do that in the mist of the busy time of the year. A nice condo which my daughter and her husband used. The only complaint is that the bedding is old and outdated. The sheets need to be replaced with new. Otherwise, place was nice. 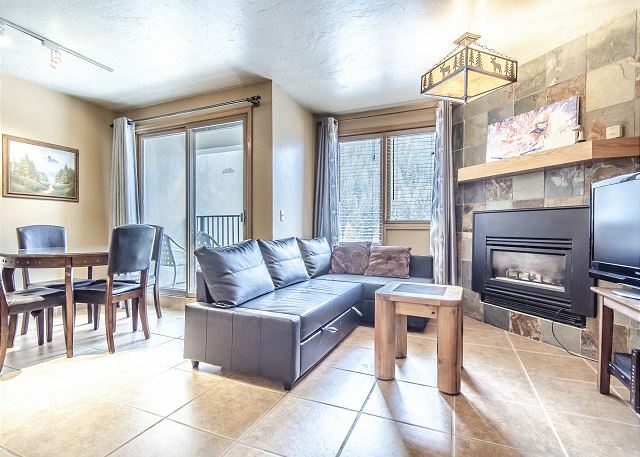 Appreciate you taking your time to write about your recent stay at this 1 bedroom at Iron Horse. We have added a mattress topper for the sofa sleeper. Will go and take a look at the bedding tomorrow - and hope to get owners permission to replace!! The unit was good for what we needed. A little crowded for four (4) people, but it worked. All the items in the unit were good and we did not need to ask for anything. 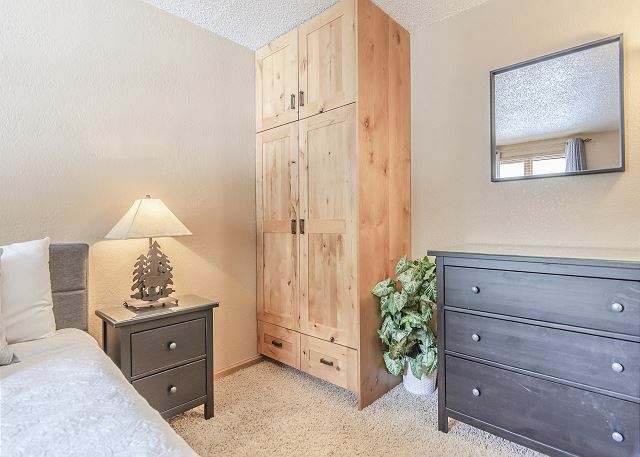 For the price of this unit, they should have a TV in the bedroom. The cable is just on the other side of the wall and could be easily added. Thanks for your feedback in regards to the TV in bedroom. I will make sure that we forward it to the owner and hope that he will allow us to buy a TV + pay every month for the extra cable box. Very nice condo and great experience working with Charlotte and Nick. Ski-in/ski-out was challenging for snowboarders due to the flat catwalk, but skiers didn't seem to have a problem! Everyone at the property was very nice - would definitely stay at Iron Horse again. 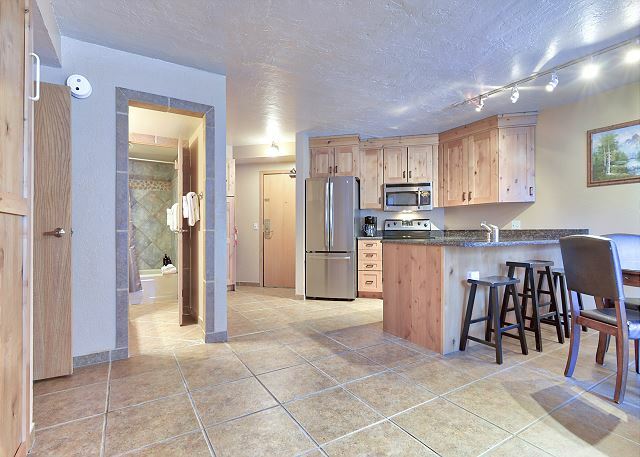 Thanks for taking your time to write about your experience at this 1 bedroom @ Iron Horse. Pls don't hesitate to contact us ...should you plan on coming back to Winter Park again! !